B.P.J College of Arts and Science, Cuddalore has advertised in the Dinamalar newspaper for recruitment of Teaching Faculty-Principal, Assistant Professor jobs vacancies. Interested and eligible job aspirants are requested to apply with in 7 days. Check out further more details below. Principal : M. A, M.Sc, M.com, with Ph.D 10 years of experience in college service. 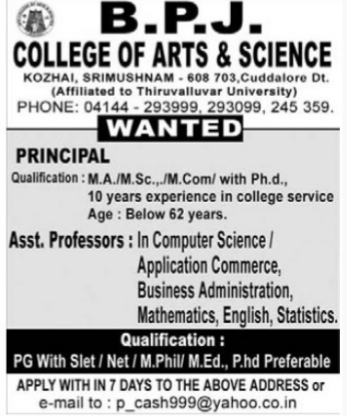 Assistant Professor: PG with SLET,Net/M.Phil/Ph. D preferable. Good salary for deserving candidates.